Installing hardwood flooring can dramatically upgrade the warmth and beauty of any space. Whether it’s your home or business, wood floors bring a certain aesthetic that ties a room together. They also increase to property value and easily hold up in high-traffic areas. While many types of flooring require regular updates, low cost hardwood flooring provides long-lasting durability and luster to your home or business. At our hardwood flooring store in Houston, we invite you to explore the wonderful options we offer with one of our professionals to create a floor that’s right for you. The tremendous ambiance and quality material used in hardwood flooring leads many property owners to believe it is expensive. That is not necessarily the case. Like any product, there are a wide range of prices. At our hardwood flooring store in Houston, we can look at budget-friendly options and upgrade your space. There are numerous varieties of hardwood flooring installation Houston residents can enjoy. Each species has a unique color and creates a different look and feel. Consider some of these classic finishes and how they’ll reinvigorate your living environment. Much of the European oak on the market today is imported from France and Germany. Americans have grown fascinated with it because of its unique appearance. European saw mills use a technique that removes a square from the middle of each log. European lumber also grows slowly and that creates a tighter grain than fast-grown timber. The combination of these things allows European mills to produce wider planks that look very different than wood from other regions. 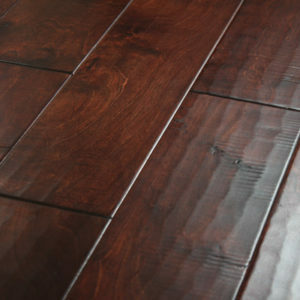 Although unique, this is a type of hardwood flooring installation Houston homes and businesses can enjoy. This hardwood offers tremendous flooring versatility. Hickory can create a look from rustic to contemporary, depending on the grade you select. It is also considered one of our hardest domestic woods. This domestic wood tends to come trend toward light shades, infused with reds and browns. This give the product a striking visual appearance when installed. Walnut: Considered one of the softer hardwoods, it’s important to install walnut in lower traffic areas. Many people enjoy the vibrant grain and the way it accents wood furniture. Walnut can bring a room together and provide excellent balance. This strong hardwood offers color flexibility. Depending on the select material, maple’s hues can vary. Considered one of the strongest hardwoods, you can install maple in high-traffic areas and it makes spaces appear large and more open. Engineered hardwood flooring was initially made to use as primary layer on concrete slabs. But the technology around this product has moved forward by leaps and bounds. Today, it stands on equal and sometimes better footing than other types of wood flooring. While it appears just like other hardwood floor materials, it offers greater protections. Engineered wood has greater resistance to moisture and buckling. Some of the recent products are thinly designed with tongue-in-groove capabilities that can cover an existing floor. That means you save on the expense of removal and preparation labor. In terms of budget, engineered hardwood flooring provides all the natural beauty of other products. However, it can be a tremendous cost-saver and increase property values. Engineered wood flooring is comprised of 100 percent wood. The top layer is a veneer of the species that provides the look you desire. Below that are layers of manufactured wood materials that are compressed together by a high-tech process. Many come with a factory finish and their installation saves money on labor costs. Because they are manufactured, the products tend to have more consistent finishes and enjoy a wide variety of sizes and variations. Engineered wood flooring has become very popular and makes up more than 30 percent of all wood flooring products sold on the market today. The trained professionals at our hardwood flooring store in Houston can discuss material, color, board width and a design plan that can enhance your home or commercial property.